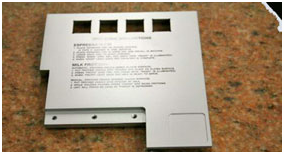 PMI’s team provides expert quality printing. Why not add your logo in color to your parts? Precision Metal Industries offers professional silk screening in house, where our team of skilled, talented and well trained personnel provides the professional quality printing you need! PMI offers silk screening for printing your logos, information or intricate designs on parts of any material. Our in-house silk screening service includes the custom creation of screens for the printing process.